Do you feel a need for more torque and horsepower? If this is your ultimate goal then the all new WK551-38 is the Weber Conversion kit for you. This conversion kit works well for any 6cyl application regardless of modifications. This conversion kit will give you a gain in horsepower as much as 20%. This is a great example of the Weber Carburetors reputation for adaptability and infinite tuning capabilities. Not legal in CA, check local regulations concerning aftermarket carbs and emissions. Replaces Carter BBD 2 barrrel carb. Designed for motors that have been worked over in the way of cam/crank/header modifications. May need to buy a fuel regulator for optimal performance. 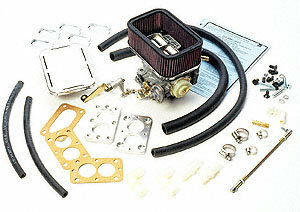 Conversion kit includes 38 DGES Weber Carburetor, manifold adapter, Linkage, Chrome Air cleaner, fully illustrated instructions, and all necessary hardware for installation.